We all knew he’d do it. The only question was when. Well, now the waiting is over. Ronnie Weedon of Pleasant Valley won his 500th career feature on Friday (Aug. 15) at Davenport Speedway. What an accomplishment! Just think about it: Ronnie is 71 years young. And he’s been racing since he was 16; that’s 55 seasons. The 500 career features means Ronnie has captured, on average, 9.09 main events for every year he has competed. “It was nice to do, especially in Davenport,” Ronnie said. He also mentions “something real ironic” that took place on the night of his big accomplishment. 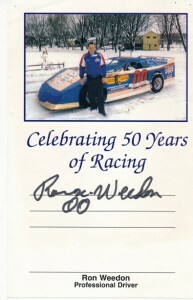 Ronnie began his racing career at the Mahoney’s track, located under what is now Lake Canyada in west Davenport, in 1948. And that’s the track where Gus began his flagging career a few races into the 1948 season. “I thought it was great,” Gus said of Ronnie’s win. He flagged races at five different tracks from 1948 to 1976, Gus told me in a phone interview. He was at Mahoney’s most of 1948 and all of 1949. He got the job there after complaining about the man who had had it. Gus is in his 80s now and has a little trouble getting around. He knows that old age creeps up on a guy. “One of these days, he’s going to have to quit,” he said of Ronnie. Ronnie’s 500th win came in a Modified car. He switched to Modifieds from Late Models several years ago, and he loves the racing division. Well, he did catch them — and pass them — for that 500th win. And celebrating with him was Dee. She was “just tickled to death,” Ronnie said. Dee has been his racing companion, as well as his wife, since 1961. Now it’s mainly Ronnie and Dee working on the car. Despite his 71 years, Ronnie is still young at heart. “But it’s only true in how you feel. It isn’t true in how people look at you. You’re still the old fart. Well, he may be an “old fart,” but Ronnie can get around the track as well as competitors one half or one third his years.